September | 2009 | Ding! Why get so excited about mono? Isn’t that like getting excited that a film, previously only available in colour is now re-released in black and white? No, not at all. In fact, listening the the mono versions sound more colourful than ever. There are a few startling differences and quite a few surprises to be found in mono. 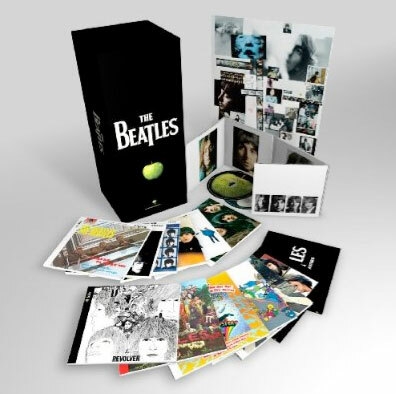 The first thing you notice about the small white boxed set is that it costs quite a bit more than the larger stereo boxed set with two LPs less than the stereo box, namely Abbey Road and Let it Be. This is because those last two LPs were never mixed in mono, only in stereo. A two-disc Mono Masters pack is included through, which mops up singles, b-sides and rare tracks that were mixed originally in mono but weren’t on the official albums such as She Loves You and Hey Jude. The Beatles believed in value – they never released a single off an LP (until their last LP) and rarely included singles on their albums, hence the need for the extra compilation. The most exciting thing about the mono box is that all the albums come in miniature replicas of the original LPs. Every detail is correct, all the original text is there, even on the spines. The CD face artwork is a replica of the correct original centre label. The CDs even come in miniature replicas of the correct LP sleeve that the original vinyl came in, including a plastic liner. These dust sleeves were usually plain with adverts for EMI’s stylus cleaning EMITEX on until Sgt Pepper when the Beatles were the first act to use this extra space to be designed along with the rest of the sleeve. So the packaging is perfect and almost worth getting just to have in itself. But then we have the real question: why buy the CDs in mono at all? Surely mono is a bit primitive? Why didn’t they just do stereo CDs? The answers are more interesting than you think. Until the late 1960s (or until 1984 in our house) most people had a record player, not a hi-fi. A record player was designed as a single unit to play 78, 45 and 33&1/3 vinyl singles and albums. The needle at the end of the stylus picked up one signal from the groove on the record, converted the vibration to electrical energy which was amplified (by an electric system using valves, not transistors) and fed to a single speaker: mono. Everything was recorded in mono. Only rich audiophiles had stereo players as they were so expensive and the only stereo records were a few classical orchestral experiments and curious ‘sound effect’ LPs where you could hear the three dimensional sound of stereo, if your speakers wee positioned properly, of amazing things like a car going past or bird song. So when the Beatles came to do their first recordings at EMI in Abbey Road in 1962 they were forced to use mono equipment. Abbey Road was pretty advanced: it had a two track recording machine. This allowed George Martin to put the drums and bass on one track and the guitars and vocals on another. No overdubs (such as extra guitars or vocals added to the recording later) could be done unless he copied the two tracks onto a single track of another tape, freeing up the second track. On subsequent albums, this is what he did, but on the first two, it’s just the four Beatles, right there in he studio, live. By A Hard Days Night in early 1964, EMI obtained a four track tape recorder and it was this that was used right up until the eight track that arrived after Sgt Pepper, just in time for the White Album. This meant that mixing a stereo album was almost impossible from the two track recordings of the early albums without having the drums on one side and the vocals on another. But when the four track was used it was possible to create a better stereo picture, placing the instruments more towards the left or right. What makes the newly released mono boxed set so compelling is that the Beatles and George Martin spent dozens of hours mixing the levels of the instruments for the mono releases but just a few hours re-mixing them for stereo. In other words, the mono versions are the definitive versions that they really wanted us to hear, the stereo versions were an afterthought. This becomes more interesting when we discover that there are some quite major differences between the mono and stereo versions. Until their their 7th LP, Revolver, from 1966, the differences are not two apparent. But as soon as the recordings get more complicated with more effects laid on the instruments and voices and multiple overdubs, the mixing in the mono is noticeably, and in the case of Sgt Pepper and the White Album, shockingly different. On Revolver’s Tomorrow Never Knows, the ‘seagull’ sounds are more prominent and scary. The effects on Yellow Submarine are different and the stereo error at the start of the first verse of Eleanor Rigby (very noticeable i stereo on headphones) is obviously not there. It’s long been said that if you haven’t heard Sgt Pepper properly until you’ve heard it in mono, so my next entry will be focused on just that. If you have a set of scratch-free Beatles vinyl from the 1960s (not late 70s or 80’s re-pressings on thin vinyl with loss of dynamic range) and a good solid deck with a sharp stylus and valve amplifier you can probably do without the mono boxed set. If not, and you want to hear what the fabs and George Martin wanted you to hear, get hold of a set now while you can. If you’re not a Beatles fan you can skip this article. I’ll not go on about how you’re in the minority and are missing out. After all, you can point the finger at me for not being a fan of Shakespeare or Mozart. I acknowledge them and occasionally dip into their stuff, but I’m not particularly a fan. But I am a fan of the Beatles so this is written unashamedly from that perspective. 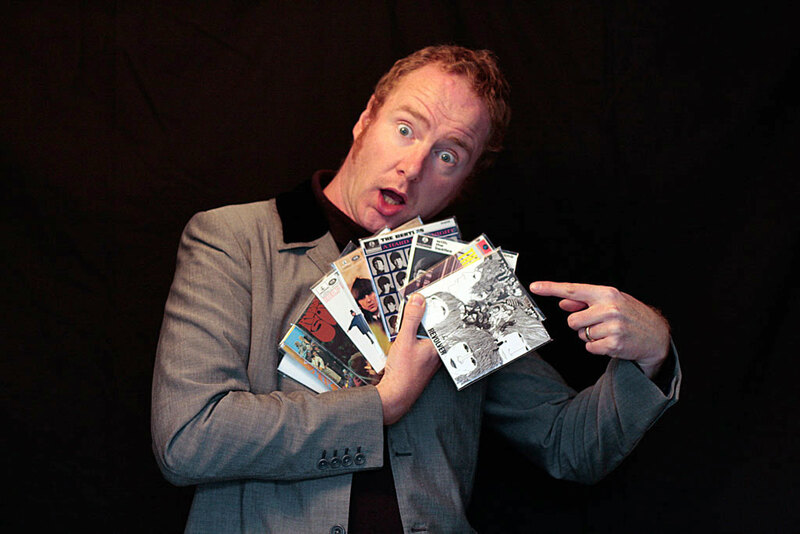 You’ll have noticed the big push and excitement over the Beatles re-mastered CDs for both the boxed sets of their recorded canon and the interactive computer game Rock Band. The LPs were back in the upper reaches of the sales charts once again. They’d have been a lot higher if the charts had included sales of the boxed sets, which they didn’t. 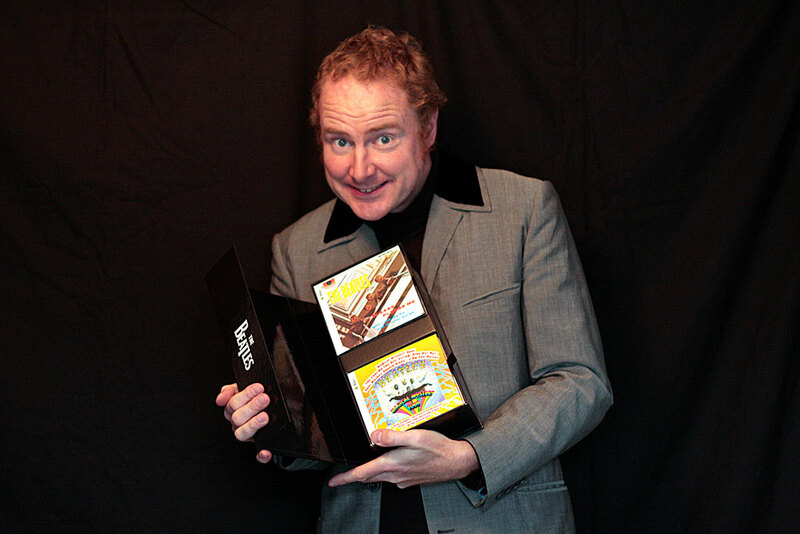 The CDs come in three styles. You can get them individually in nice new digipacks with extra sleevenotes and photos or bundled together in a big boxed set. 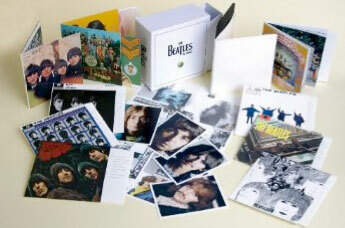 But there was another choice, if you were quick – a limited edition, smaller white box called The Beatles in Mono. I, of course, pre-ordered both boxes and although expensive, I’m pretty pleased with what I’ve got. It’s an interesting point that Beatle customers may have bought essentially the same thing multiple times. I have the albums and some singles on vinyl. I’ve got a set of the 1986/87 CD releases of the same LPs and now I have all those CDs again in nice new shiny covers in stereo and again in the mono boxed set. But I bet you’re not wearing the same clothes you wore in 1966, or driving the same car that you drove in 1987 either. If you’ve read this far, you must have some interest in the music. If you’ve enjoyed a Beatles album before, put them away or give them away and get one of the re-mastered versions. The change is remarkable. What happened was that in 1986 we were effectively conned. The digitisation from the original master tapes which were beautifully recorded in 1962 to 1970 was done on fairly crummy and primitive equipment in the 1980s. I didn’t believe it until I’d heard it. The new versions not only sound brighter, cleaner and clearer but you can hear individual instruments that were just mushed together previously. It really does sound as if the band have been transported through time to today and have re-recorded the music with today’s technology. When you listen, you are in the room with them. You can hear the flem in Lennon’s voice. Guitar notes sound punchier and more visible, and we hear at last the genius of Ringo’s underestimated percussion. Whether you dip into any of the LPs or whop out a ton of cash on the mono editions you’ll hear a massive difference on every track from Love Me Do to Let it Be. But it’s the mono versions that hold the most excitement and I describe why in the next article.